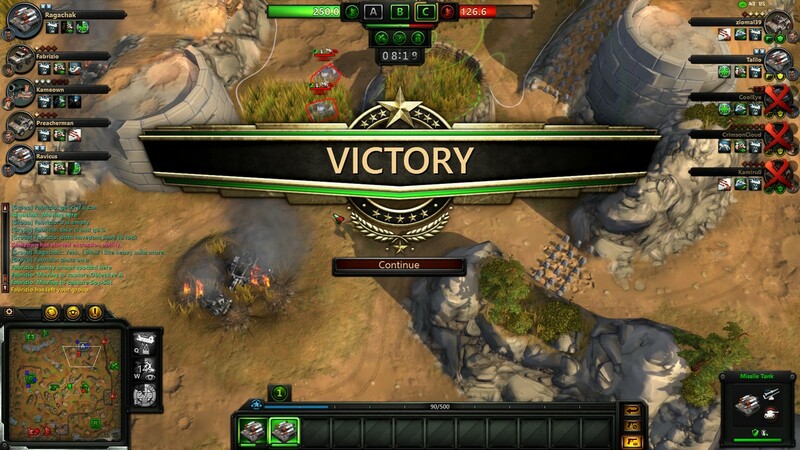 From one of the minds that brought you Command and Conquer and End of Nations comes Victory Command! 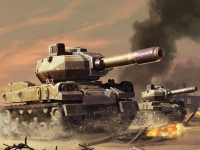 Petroglyph, Victory Commander’s developer, has a great deal of RTS in their veins with Grey Goo, Star Wars: Empire at War, as well as the Dune/Command and Conquer RTS series. So there is little doubt that they are familiar with the genre. 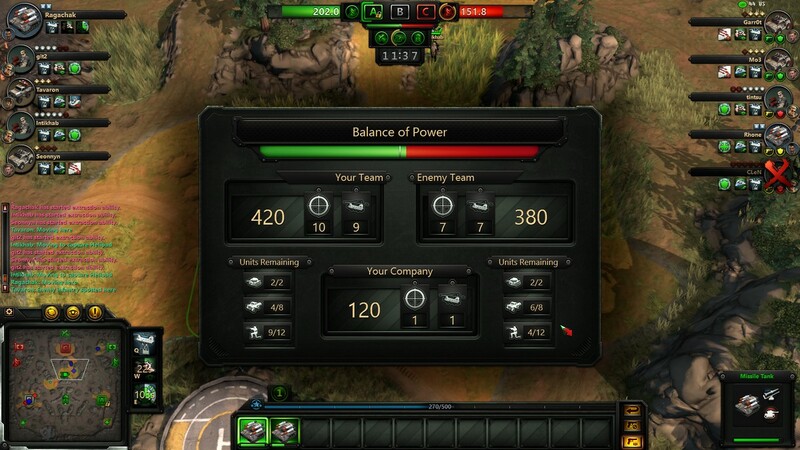 Victory Command is a different kind of military strategy title in its own way. 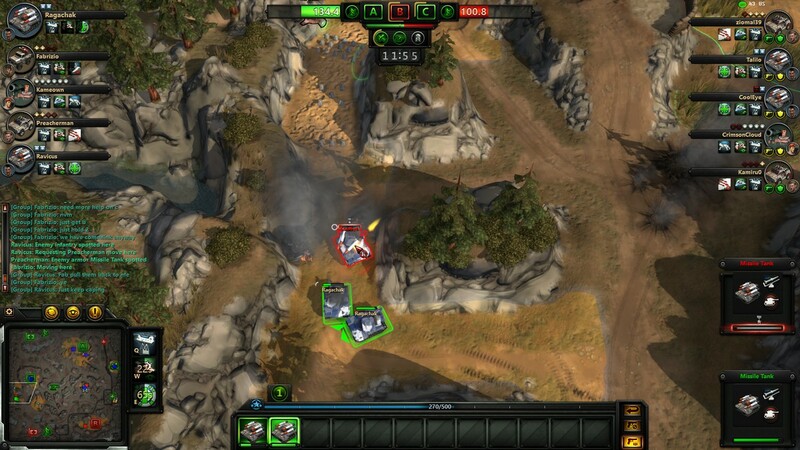 Instead of a first or third person shooter, it is an over the top RTS that is played online with a group of four other players. I was fortunate enough to acquire a code during the third weekend beta, which may or may not have involved me overthrowing my boss and taking hold of his beta key. Your goal is to either destroy the opposing vehicles or acquire enough points (250 in total) to claim victory. 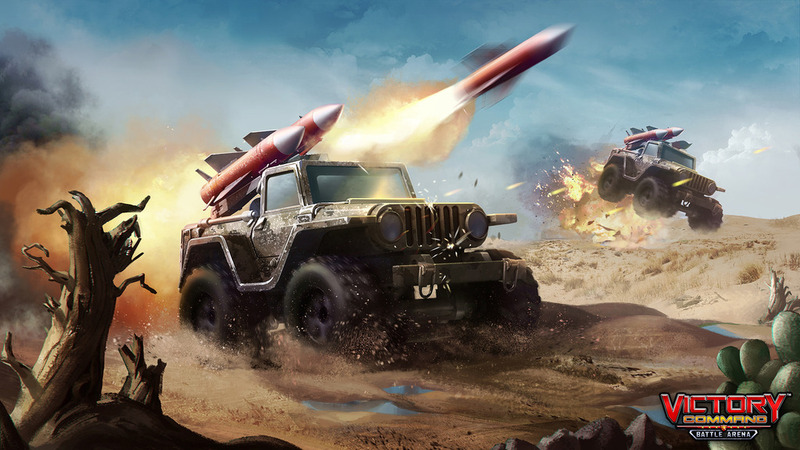 It is ultimately a battle arena, where two teams of five with a variety of jeeps, tanks, or infantry units will work together to claim the map for yourself. The game is pretty simple to get into, but how well you work with your team and utilize your particular skills to emphasize your strengths will determine victory or defeat. 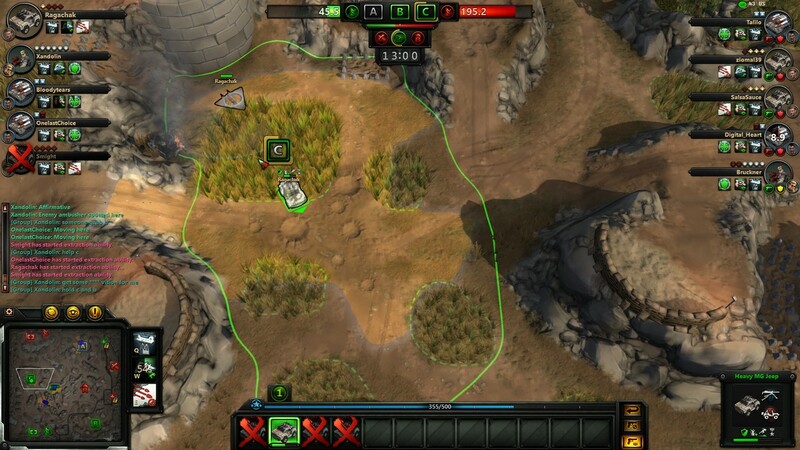 Multiplayer RTS arena would appear to be pretty tricky, but map awareness, spy drones, and a few rockets will net you intense excitement at every turn. There are three types of units in the game, each with their own strengths and weaknesses. These can vary as you progress through the tiers, since each vehicle is different, but they seem to follow a pretty logical pattern. You have Infantry, Jeeps, and Tanks. It feels similar to Rock Paper Scissors, but luckily as the game progresses you can customize these units to make each and every battle unique. Each unit also has a trio of abilities: a base evacuation skill, an attack skill, and a utility skill such as “Ninja Vanish” to cloud the area, a heal over time, a speed boost, and many other powers. These are on a cooldown so they cannot be dropped repeatedly. 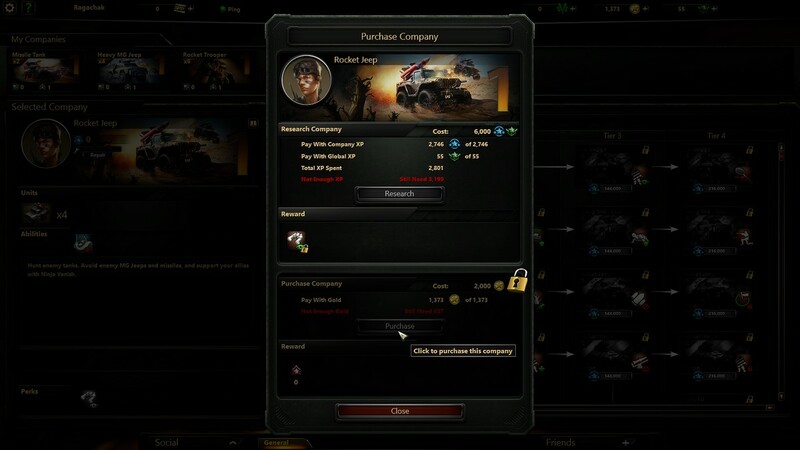 Units are separated into tiers, which require experience in that type of vehicle to research, plus gold to purchase the researched vehicle or technology. 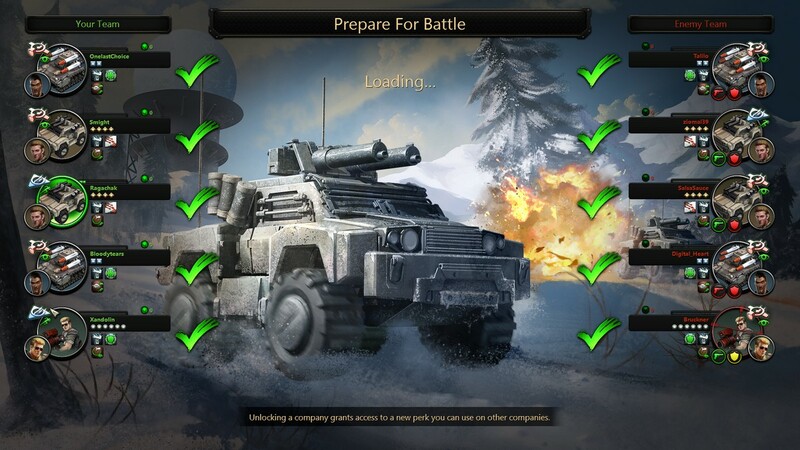 This puts me off, since it’s really no different from War Thunder, World of <Insert Vehicle>, or any other military game. I was hoping as an RTS instead of a shooter, they would try a different, more interesting system, even a leveling system! This is pretty disappointing, but the vehicles are all quite different from each other. 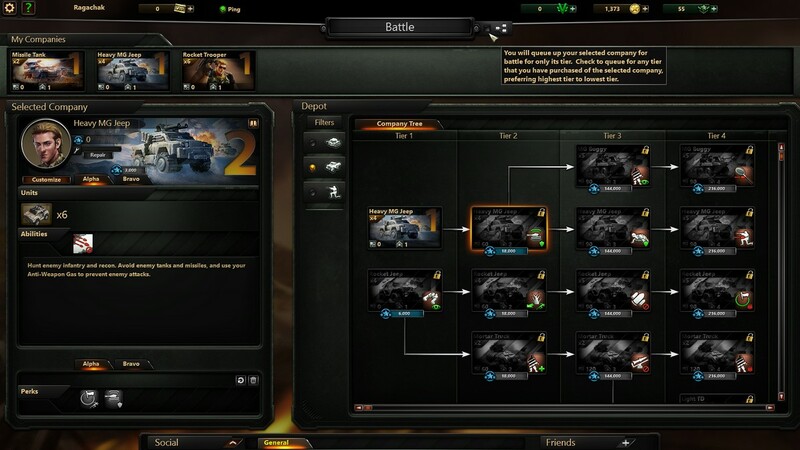 The Tier 1 tanks are a Flame Tank that you can unlock and the starter vehicle, with the Flame Tank bringing an unusual counterbalance to its position by being strong vs Infantry, while other tanks have a rough time. It is also important to note that height of terrain is an efficient means of overcoming a disadvantage. There are choke points with higher elevations over them where you can position guards or scouts to protect zones or ambush foes. Just as dangerous is the risk of getting caught by tanks while moving through low valleys with your troops crammed into a British line. Always pay attention to your surroundings, and consider if you’re putting your squadron at risk! We can’t all be winners, you know. One of the things I think is interesting about this title is that there is no respawn mechanic. Once all of the units you have are dead, that’s it. This happened remarkably fast in my very first match. I stormed into a blindspot creating bush thinking I was unstoppable! On the other side was the entire enemy team, that ended my match in a barrage of bullets about as quickly as my mind registered how screwed I was. Each type of vehicle has a different number of units. So far, Jeeps have 4, Tanks have 2, and Infantry have 6. Luckily this is an RTS, so you do not have to move them all at once. You can move them in as many different places as you would like, but be aware that they are not as strong alone. The game becomes a mix of risking partial squadrons to scout and pinpoint weaknesses before uniting to crush your foes when they least expect it. It is high risk, high reward unforgiving gameplay. Vision is incredibly important, enough so that risking half your team is well worth it. You have Spy Drones that you can deploy which act as wards in a regular MOBA, but if they do not have camo, the drone can be blown up. There are lengths of bush similar to League of Legends which you can hide in, though Drones will show you if they are in range. The goal of the game is to rack up enough points to secure victory or to simply blow up the entire enemy team in the process. Good coordination and teamwork will make these both fairly trying if your own team cannot work together though. This is definitely a team game, and one player will not be able to do it on his own. Each map is put together a little differently, but they all have three Chokepoints (A, B, C), as well as other points (Helipad, Spy Satellites and more) that have benefits to your team. The Helipad, for example, decreases your evac time, and locking the position under your control also lowers the time until you’re marked as out of the fight. “Locking” is a game mechanic that is pretty interesting as well. After you control a point, you can stay longer and “lock” the point to you, which will tick down over a set period of time. This will prevent the enemy from simply entering and taking it instantly; instead they will have to wait and hope you don’t see them there, or flat out blown you out of the region to take it by force! Though my time with this game was brief over this three day event, I have to say I’m pretty intrigued by it. Even though there’s no respawn mechanic, you can still influence the game and that’s pretty cool. I noticed that you can still deploy Spy Drones so that you at least benefit your team somewhat. Though portions of it feel incredibly generic, such as the research system, and the voices were sparse at the time, I understand this is still in beta. When I saw that my pilot was a Russian sociopath, I expected to sound the part. Instead I still sounded like a Southern US Marine, and I was definitely thrown off by that. I’m hoping as the game progresses through Steam Early Access, these minor gripes will be addressed. Considering the beta state though, there are already some much needed features already in place. The ability to queue with only people who are choosing vehicles in your tier is a Godsend. That means you won’t have to potentially deal with all the amazing, super powerful high-tier weaponry that’s beyond your research level. Though if you’re looking to speed queue up, or just get a preview of the glory to come as you progress in the game, you can queue with everyone to remove this restriction. My only worry on this is veterans busting out their lower tier units to dominate novices, though I’m sure an elo system is already in the works to address this once the playerbase grows. Overall the game is fun and pretty fast paced, and will offer something new to the military gamer.